When you decide on living arrangements for your pet turtles, think things through carefully. Turtles of different species shouldn't share enclosures. Many problems can arise from allowing them to do so, including potential disease transmission, severe territorial aggression and conflicting climate requirements. 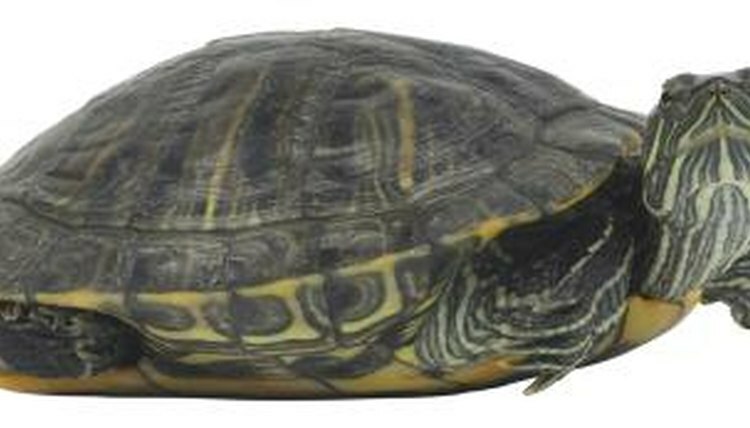 Turtles of different species, in most cases, should not share a tank. While turtles of varying species can be tranquil together, the potential problem is a health matter. If one turtle comes from a different area than another, one might be invulnerable to ailments the other carries. If through contact one transmits something to a cage mate of a different species, there's no certainty that the other one will have the same protection. This could lead to the other turtle getting extremely sick and in some cases passing away. Prevent these types of dangers from occurring by refraining from placing different species together. Different types of turtles have specific food and climate needs. Never allow a turtle to reside in a setting that isn't geared to her own species' demands. Some owners allow painted turtles (Chrysemys picta), slider turtles (Trachemys scripta) and Florida red-bellied turtles (Pseudemys nelsoni) to live together because of their lifestyle commonalitles, but don't do this unless you speak with a herpetological veterinarian first. Turtles across the board also frequently exhibit differences in disposition. Some species of turtles, simply put, are more timid than others. If a meek turtle has no choice but to live with a bolder and more outgoing specimen, he might become the target of lots of harassment, perhaps even in the form of aggression. Aggression between turtles can often escalate to violence that can be deadly, or at least that can bring upon some major wounds. Don't assume that turtles from the same species will necessarily work well together, either. Many types of turtles possess strong territorial streaks, notably those of the aquatic variety. If boy turtles of the same species live together in cramped quarters, some severe fierceness could ensue. It can be extremely risky to place small and large individuals together, too. Youngsters and mature specimens should not be in the same enclosures, even if they're of the same species. If you have questions regarding appropriate turtle housing, don't hesitate to consult a herpetological veterinarian. Turtle - Your Happy Healthy Pet; Lenny Flank Jr.